In his Wednesday column (“Japan’s bumpy road to recovery“) in the Financial Times, the estimable Martin Wolf provided a sober assessment of the recent gyrations of the Japanese bond and stock markets and the yen. I was especially struck by this passage. [C]riticism over the decline in the yen is coming from abroad. Many, particularly in east Asia, agree with the warning from David Li of Tsinghua University that, far from a rise in Japanese inflation, “the world has merely seen a sharp devaluation of the yen. This devaluation is both unfair on other countries and unsustainable.” In a letter to the FT, Takashi Ito from Tokyo responded: “I just find it unbearable that countries that have debased or manipulated their currency can accuse Japan of depreciating the yen”. This does begin to look like a currency war. In a couple of posts last November about whether China was engaging in currency manipulation, I first gave China a qualified pass and then reversed my position after looking a bit more closely into the way in which the Chinese central bank (PBoC) was imposing high reserve requirements on commercial banks when creating deposits, thereby effectively sterilizing inflows of foreign exchange, or more accurately forcing the inflow of foreign exchange as a condition for expanding the domestic Chinese money supply to meet the burgeoning domestic Chinese demand to hold cash. So to answer the question whether Japan has been manipulating its currency to drive down the value of the yen, the place to start is to look at what has happened to Japanese foreign-exchange holdings. If Japan has been manipulating its currency, then the reduction in the external value of the yen would be accompanied by an inflow of foreign exchange. 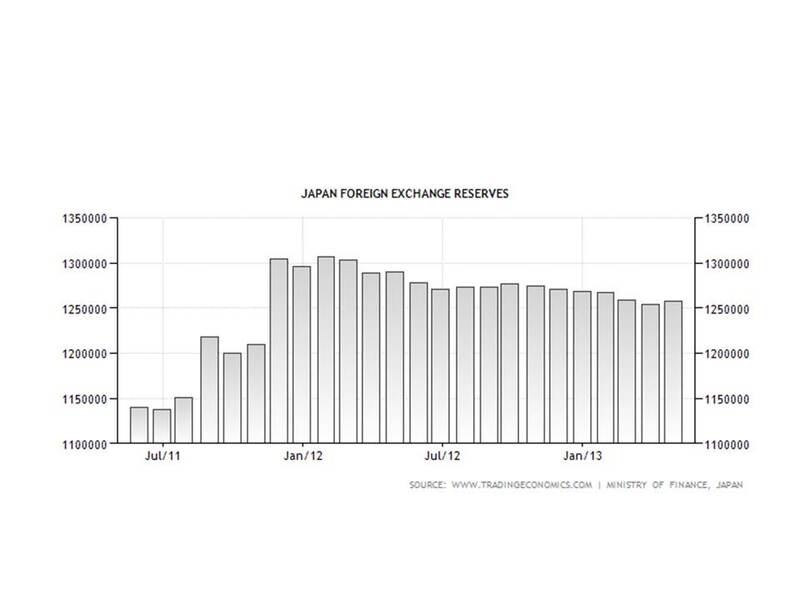 The chart below suggests that Japanese holdings of foreign exchange have decreased somewhat over the past six months. However, this item from Bloomberg suggests that the reduction in foreign exchange reserves may have been achieved simply by swapping foreign exchange reserves for different foreign assets which, for purposes of determining whether Japan is manipulating its currency, would be a wash.
Japan plans to use its foreign- exchange reserves to buy bonds issued by the European Stabilitylity Mechanism and euro-area sovereigns, as the nation seeks to weaken its currency, Finance Minister Taro Aso said. “The financial stability of Europe will help the stability of foreign-exchange rates, including the yen,” Aso told reporters today at a briefing in Tokyo. “From this perspective, Japan plans to buy ESM bonds,” he said. The purchase amount is undecided, Aso said. The move may help Prime Minister Shinzo Abe temper criticism of Japan’s currency policies from trading partners such as the U.S. The yen has fallen around 8 percent against the dollar since mid-November on Abe’s pledge to reverse more than a decade of deflation as his Liberal Democratic Party won an election victory last month. “The Europeans would be happy to see Japan buy ESM bonds, so Japan can avoid criticism from abroad and at the same time achieve its objective,” said Masaaki Kanno, chief economist at JPMorgan Securities Japan Co. and a former central bank official. So I regret to say that my initial quick look at the currency manipulation issue does not allow me to absolve Japan of the charge of being a currency manipulator. It was, in fact, something of a puzzle that, despite the increase in Japanese real GDP of 3.5% in the first quarter, the implicit Japanese price deflator declined in the first quarter. If Japan is not using currency depreciation as a tool to create inflation, then its policy is in fact perverse and will lead to disaster. It would also explain why doubts are increasing that Japan will be able to reach its 2% inflation target. I hope that I’m wrong, but, after the high hopes engendered by the advent of Abenomics, I am starting to get an uneasy feeling about what is happening there. I invite others more skillful in understanding the intricacies of foreign exchange reserves and central bank balance sheets to weigh in and enlighten us about the policy of the BoJ. [A]fter a brief surge in 2009, government spending began falling in both Europe and the United States. 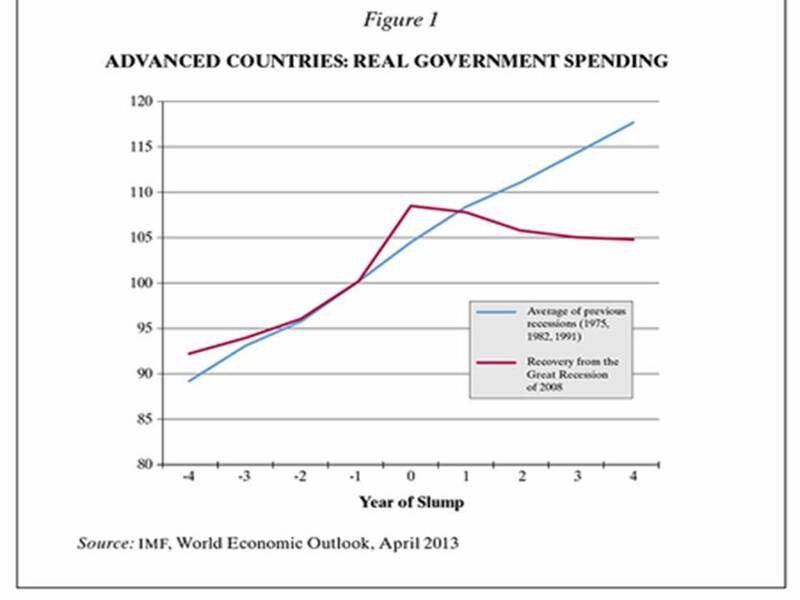 In his Figure 1 (reproduced below), Krugman identifies his zero year as 2007 (“zero year is the before global recession (2007 in the current slump) and spending is compared with its level in that base year.”) But government spending equals 100 in year -1 and increases sharply in year 0. So his figure indicates that spending increased in 2008 not 2009. It therefore seems to me that the horizontal axis in Figure 1 was mislabeled. The 90% debt-to-GDP threshold was derived from a paper, “Growth in Time of Debt,” by Reinhart and Rogoff. After other researches had repeatedly failed to replicate its results, Thomas Herndon, Michael Ash, and Robert Polin identified a coding error, missing data, and an unconventional weighting of summary statistics by Reinhart and Rogoff, the three together accounting for the existence of the otherwise inexplicable 90% threshold in the paper. Despite several attempts Reinhart and Rogoff to minimize the misleading implications of their paper, the 90% threshold, which never had any theoretical credibility, is now thoroughly discredited; any citation of it as authoritative would rightly invite scorn and ridicule. At this point, then, austerity economics is in a very bad way. Its predictions have proved utterly wrong; its founding academic documents haven’t just lost their canonized status, they’ve become the objects of much ridicule. But as I’ve pointed out, none of this (except that Excel error) should have come as a surprise: basic macroeconomics should have told everyone to expect what did, in fact, happen, and the papers that have now fallen into disrepute were obviously flawed from the start. What has not yet been commented on as far as I know is the extent to which the discrediting of the Reinhart-Rogoff 90% threshold has had tangible economic consequences. When the Herndon, Ash, and Pollin paper was posted on the internet about 5 weeks ago on April 15, the S&P 500 closed at 1552.36. The S&P 500 began 2013 at 1426.19, surpassing1500 on January 25. From January 25 until April 15, the S&P 500 fluctuated in the 1500 to 1550 range, only occasionally rising above or falling below those limits. On April 16 and 17, the S&P 500 rose and then fell by about 20 points, closing at 1552.01 on Wednesday April 17. On Thursday April 18, Krugman wrote his New York Times column “The Excel Depression,” the S&P 500 fell to an intraday low of 1536.03 before closing at 1541.61. The S&P 500 has subsequently risen 17 of the next 21 trading days, closing at 1667.47 on last Friday, an increase of almost 126 points, or more than 8%. I suggest that the most important economic news since April 15 may have been the collapse of the austerity caucus following the public exposure of the Reinhart-Rogoff 90% threshold as a fraud, so that the markets are no longer worried (or, at least, are less worried than before) about the risks that further fiscal tightening will offset the Fed’s modest steps in the direction of monetary ease. Another positive development has been the decline in the CPI in both March and April, reflecting fortuitous supply-side expansions associated with declining energy and commodity prices. With falling inflation expectations caused by positive supply-side (as opposed to negative demand-side) forces, real interest rates have risen sharply, the 10-year TIPS yield rising from -.69% on April 15 to -.31% on May 17. That increase in real interest rates presumably corresponds to an increase in expected future real incomes. So the economic outlook has gotten a little less bleak over the past month. Call it a reverse Reinhart-Rogoff effect. Brad Delong kindly posted a long extract from my previous post (about Martin Feldstein) on his blog. The post elicited a longish comment from Robert Waldmann who has been annoyed with me for a while, because, well, because he seem to think that I have an unnatural obsession with monetary policy. Now it’s true that I advocate monetary easing, and think monetary policy, properly administered, could help get our economy moving again, but it’s not as if I have said that fiscal policy can’t work or shouldn’t be tried. So I don’t exactly understand why Waldmann keeps insisting that he won’t calm down. Anyway, let’s have a look at Waldmann’s comment. On the other hand I also disagree with Glasner. This is the usual and I will not calm down. Well, you maybe you should reconsider. “does he believe the Fed incapable of causing the price level to increase?” Obviously not (it made no sense to type the question) as he fears higher inflation. That’s true, I started by asking why Feldstein believed a 20% increase in commodity prices was a bubble. I pointed out in my next sentence that if the Fed was causing inflation, then the increase in commodity prices was not a bubble. I wish for higher inflation, but, unlike Glasner, I don’t hope for it. the Fed has made gigantic efforts to stimulate and inflation is well below the 2% target. What would it take to convince Glasner that the Fed can’t cause higher prices right now ? It seems to me that his faith is completely impervious to data. OK, fair question. My point is that the Fed is still committed to a 2% inflation target. If the Fed said that it was aiming to increase the price level by 10% within a year and would take whatever steps necessary to raise prices by 10% and failed, that would be a fair test of the theory that the Fed can control the price level. But if the Fed is saying that it’s aiming at a 2% annual increase in the price level, and its undershooting its target, but isn’t even saying that it will do more to increase the rate of inflation, I don’t see that the proposition that the Fed can control the price level has been refuted by the evidence. The gigantic efforts that Waldmann references have all been undertaken in the context of a monetary regime that is committed to not letting the rate of inflation exceed 2%. Note the clear assumption. QE is the only possible cause of any change in asset prices. Glasner assumes that nothing else changes or that nothing else matters. He basically assumes that there is nothing under the sun but monetary policy. I think I am being entirely fair to him. I think that, in fact, he assumes not only that monetary policy affects macroeconomic developments but that it is the only thing which affects macroeconomic developments. He has made this very clear when debating me. I think his identifying assumption is indefensible. Sorry, but where is that clear assumption made? I said that rising asset prices could be attributed to an expectation that QE would increase the rate of inflation. My empirical study showed a strong correlation between inflation expectations and asset values, a correlation not present in the data before 2008. I didn’t say and my empirical study never suggested that asset prices depend on nothing else but inflation expectations, so I am at a loss to understand why Waldmann thinks that that is what I was assuming. What I do say is that monetary policy can affect the price level, not that monetary policy is the only thing that can affect the price level. I am curious as to whether there is another possible interpretation of Glasner. The answer, Professor Waldmann, is yes! Why won’t you take “yes” for an answer? I hope that helps calm you down. It should. PS I am sorry that I have not responded to comments recently. I have just been too busy. Perhaps over the weekend. Quantitative easing . . . is supposed to stimulate the economy by increasing share prices, leading to higher household wealth and therefore to increased consumer spending. Fed Chairman Ben Bernanke has described this as the “portfolio-balance” effect of the Fed’s purchase of long-term government securities instead of the traditional open-market operations that were restricted to buying and selling short-term government obligations. Here’s how it is supposed to work. When the Fed buys long-term government bonds and mortgage-backed securities, private investors are no longer able to buy those long-term assets. Investors who want long-term securities therefore have to buy equities. That drives up the price of equities, leading to more consumer spending. What Feldstein fails to ask, much less answer, is why anyone is willing to pay more for the stocks than they are worth (based on expectations of the future net cash flows generated by the underlying assets) just because they have excess cash in their pockets. Feldstein is covertly attributing irrationality to investors, although to be fair, he intimates, and has previously asserted explicitly, that the increase in stock prices since QE started was a bubble. And to be fair one more time, he is accurately characterizing Ben Bernanke’s explanation of how QE is supposed to work. But despite the Fed’s current purchases of $85 billion a month and an accumulation of more than $2 trillion of long-term assets, the economy is limping along with per capita gross domestic product rising at less than 1% a year. Although it is impossible to know what would happen without the central bank’s asset purchases, the data imply that very little increase in GDP can be attributed to the so-called portfolio-balance effect of the Fed’s actions. Even if all of the rise in the value of household equities since quantitative easing began could be attributed to the Fed policy, the implied increase in consumer spending would be quite small. According to the Federal Reserve’s Flow of Funds data, the total value of household stocks and mutual funds rose by $3.6 trillion between the end of 2009 and the end of 2012. Since past experience implies that each dollar of increased wealth raises consumer spending by about four cents, the $3.6 trillion rise in the value of equities would raise the level of consumer spending by about $144 billion over three years, equivalent to an annual increase of $48 billion or 0.3% of nominal GDP. Again, all that is irrelevant, because the portfolio balance rationale for QE misrepresents the mechanism whereby QE can have any effect. That mechanism is primarily by preventing inflation expectations from dropping. Each one of the QE episodes has been initiated when expectations of inflation were dropping. In each instances, the announcement or even the expectation of QE succeeded in reversing the downward drift of inflation expectations, thereby contributing to expectations of increased profits and cash flows and thus allowing stock prices to recover from their deeply depressed levels after the 2007-09 downturn and panic. I explained the underlying theory in my paper “The Fisher Effect under Deflationary Expectations,” which also provided supporting empirical evidence showing of a strong positive correlation since 2008 between inflation expectations as measured by the TIPS spread and stock prices, a correlation not predicted by conventional theory and not observed in the data until 2008. This 0.3% overstates the potential contribution of quantitative easing to the annual growth of GDP, since some of the increase in the value of household equities resulted from new saving and the resulting portfolio investment rather than from the rise in share prices. More important, the rise in equity prices also reflected a general increase in earnings per share and an increase in investor confidence after 2009 that the economy would not slide back into recession. Earnings per share of the Standard & Poor’s 500 stocks rose 50% in 2010 and a further 9% in 2011, driving the increase in share prices. The S&P price-earnings ratio actually fell to 17 at the start of 2013 from 21 at the start of 2010, showing the importance of increased earnings rather than an increased demand for equities. In other words, QE helped to improve earnings, thus validating the expectations that caused the increase in stock prices. In short, it isn’t at all clear that the Fed’s long-term asset purchases have raised equity values as the portfolio balance theory predicted. Even if it did account for the entire rise in equity values, the increase in household equity wealth would have only a relatively small effect on consumer spending and GDP growth. Feldstein continues to attack a strawman, albeit one presented to him by Ben Bernanke. Mr. Bernanke has emphasized that the use of unconventional monetary policy requires a cost-benefit analysis that compares the gains that quantitative easing can achieve with the risks of asset-price bubbles, future inflation, and the other potential effects of a rapidly growing Fed balance sheet. I think the risks are now clear and the benefits are doubtful. The time has come for the Fed to recognize that it cannot stimulate growth and that a stronger recovery must depend on fiscal actions and tax reform by the White House and Congress. Feldstein’s closing comment reminded me of a piece that he wrote two and a half years ago in the Financial Times entitled “QE2 is risky and should be limited.” Here are the first and last paragraphs of the FT contribution. The truth is there is little more that the Fed can do to raise economic activity. What is required is action by the president and Congress: to help homeowners with negative equity and businesses that cannot get credit, to remove the threat of higher tax rates, and reduce the out-year fiscal deficits. Any QE should be limited and temporary. I was not yet blogging in 2010, but I was annoyed enough by Feldstein to write this letter to the editor. Sir, Arguing against quantitative easing, Martin Feldstein (“QE2 is risky and should be limited“, Comment, November 3) asserts that Federal Reserve signals that it would engage in QE, having depressed long-term interest rates, are fuelling asset and commodities bubbles that will burst once interest rates return to normal levels. In fact, since Ben Bernanke made known his intent to ease monetary policy on August 29, longer-term rates have edged up. So rising asset and commodities prices are due not to falling long-term rates, but to expectations of rising future revenue streams. Investors, evidently, anticipate either rising output, rising prices or, most likely, some of both. Why Mr Feldstein considers the recent modest rise in commodities and asset prices (the S&P is still more than 20 per cent below its 2007 all-time high) to be a bubble is not clear. Does he believe that with 15m US workers unemployed, expectations of increased output are irrational? Or does he believe the Fed incapable of causing the price level to increase? It would be odd if it were the latter, because Mr Feldstein goes on to insist that QE is dangerous because it may cause an “unwanted rise in inflation”? Perhaps Mr Feldstein thinks that expectations of rising prices and rising output are inconsistent with expectations that interest rates will not rise sharply in the future, so that asset prices must take a hit when interest rates finally do rise. But he acknowledges that expectations of future inflation may allow real rates to fall into negative territory to reflect the current dismal economic climate. Since August 29, rates on inflation-adjusted Tips bonds have fallen below zero. Rising asset prices indicate the expectation of QE is inducing investors to shift out of cash into real assets, presaging increased real investment and a pick-up in recovery. Why then is inflation “unwanted”? Mr Feldstein maintains that it would jeopardise the credibility of the Fed’s long-term inflation strategy. But it is not clear why Fed credibility would be jeopardised more by a temporary increase, than by a temporary decrease, in inflation, or, indeed, why credibility would be jeopardised at all by a short-term increase in inflation to compensate for a prior short-term decrease? The inflexible conception of inflation targeting espoused by Mr Feldstein, painfully articulated in Federal Open Market Committee minutes, led the Fed into a disastrous tightening of monetary policy between March and October 2008, while the US economy was falling into a deepening recession because of a misplaced concern that rising oil and food prices would cause inflation expectations to run out of control. Two years later, Mr Feldstein, having learnt nothing and forgotten nothing, is urging the Fed to persist in its earlier mistake because of a neurotic concern that inflation expectations may soar amid massive unemployment and idle resources. This may not be the most important news of the day, but for those wishing to immerse themselves in the economics of Hawtrey and Cassel, a newly revised version of my paper with Ron Batchelder “Pre-Keynesian Monetary Explanations of the Great Depression: Whatever Happened to Hawtrey and Cassel?” is now available on SSRN. The paper has also recently been submitted to a journal for review, so we are hoping that it will finally be published before too long. Wish us luck. Here’s the slightly revised abstract. A strictly monetary theory of the Great Depression is generally thought to have originated with Milton Friedman. Designed to counter the Keynesian notion that the Depression resulted from instabilities inherent in modern capitalist economies, Friedman’s explanation identified the culprit as an ill-conceived monetary policy pursued by an inept Federal Reserve Board. More recent work on the Depression suggests that the causes of the Depression, rooted in the attempt to restore an international gold standard that had been suspended after World War I started, were more international in scope than Friedman believed. We document that current views about the causes of the Depression were anticipated in the 1920s by Ralph Hawtrey and Gustav Cassel who independently warned that restoring the gold standard risked causing a disastrous deflation unless the resulting increase in the international monetary demand for gold could be limited. Although their early warnings of potential disaster were validated, and their policy advice after the Depression started was consistently correct, their contributions were later ignored or forgotten. This paper explores the possible reasons for the remarkable disregard by later economists of the Hawtrey-Cassel monetary explanation of the Great Depression.